++ While oil and gas industry lobbyists enjoy access, regular citizen forced to confront EPA Administrator to seek answers. Feb 10, Washington, DC – Earlier today, Steve Lipsky confronted EPA Administrator Gina McCarthy in the Washington Hilton to request a meeting regarding the EPA’s withdrawal of legal action to protect his Parker County, Texas home’s drinking water from fracking-enabled oil and gas pollution. On Christmas Eve, the EPA Inspector General reported that EPA Region 6 was justified in intervening to protect Lipsky. However, it did not adequately explain why EPA withdrew. The report only said that EPA’s withdrawal “did not violate” laws or rules in doing so. Mr Lipsky’s situation in Parker County, TX is similar to the situations in Pavillion, WY and Dimock, PA. All three locations still do not have clean, safe drinking water because of the pollution caused by oil and gas drilling. All three locations have had the EPA investigate, initially find oil and gas industry responsibility for the water pollution, and then abandon the impacted communities. It’s sad that citizens have to plead and beg for the EPA and others to hear them and help them !! there must be a way to get organizations like ACLU and Public Citizen to sue or demand an investigation into our water issues since gas drilling and help Steve and others. I’ll keep asking the lawyers helping me with my case to see what can be done. I’ve asked and still waiting for action and a way. There is no excuse for the way Gina McCarthy treated Steve Lipsky today. But we need to remember that she is not in charge. 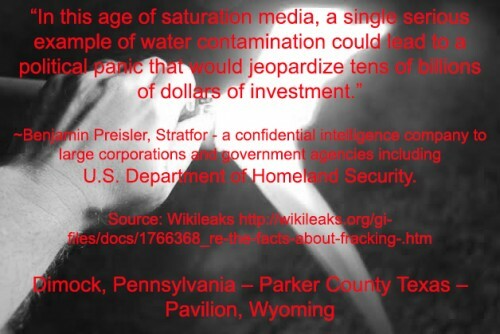 She gets her orders straight from the White House and she has been told that there will be no confirmed cases of water contamination from fracking. We need to aim our anger at the right target. Thanks for posting this Sharon. Nice clips. Gina McCarthy may not be in charge, but I can’t imagine what it’s like to take on a job to protect people, only to fail at it so miserably when they ask for help – because you’ve left your humanity at the door. I guess only she knows. And if she kept her head down any lower, her lips would’ve been dragging on the floor. Thank you Mr. Lipsky, and you too Ms. Scroggins – you are our humanity. The Feds, and other ‘regulators’ are all bought off and rotten to the core. Now-a-days, don’t trust your gubment at any level, including all 3 branches. Drilling needs to start around the WH up in DC. Lots of well, processing plants, venting, flaring, dumping, etc, etc, etc. Then maybe the ‘occupants’ will learn what they are promoting and how they are making us a Saudi-US. This bunch is much worse than Cheney & Co. in days past. In Alabama, Fracking sites are regulated and Permitted by the Alabama Oil and Gas Board. The EPA and the Alabama Department of Environmental Management agency have NO authority to monitor, regulate, inspect or penalize fracking sites, but they are authorized to address off-site contamination, spills, etc. Concerned citizens should organize in community groups and demand environmental rights to protect groundwater, because once a water source is contaminated, they have to depend on other sources. Find out if the fracking wells are located in flood zones.